Contributed by Ken Roche, this article originally ran in the James River News, a newsletter produced by the JRR Condo Association from 2005-2009. The intent of the JRR Day Trips column is to capture information on the wonderful destinations around the James River Retreat. Over time, if everybody contributes, this will become a great source of ideas of ‘Things to do’ for new owners to the retreat, existing residents looking for new ideas, and guests to your cabin who are not as familiar with the area. As the Roche clan enjoys fishing and kayaking, Judy, Ken, and Brad have all contributed to this little write up on Beaver Lake. They will arrive, and we can hope that will be sooner, rather than later. For those fishing, canoeing and kayaking, buffs out there, I’d love to share with you, one of our favorite spots of recent times. It’s so close to the retreat, it’s downright decadent! A little pond just north and west of James River is perhaps about a 20-25 minute drive. The lake is a right hand turn about 3km past Burnstick Lake campground. You need to watch for the sign very carefully as it is easy to miss. If you hit the blacktop, you’ve travelled too far. You can launch a canoe, kayak, bellyboat or little fishing boat (as long as it’s powered by an electric motor). Bird watching is excellent all year and we have spotted Bald Eagles, King Fishers, Osprey, Loons, and other web footed birds we couldn’t identify. Bring your bird book! I have found the fly fishing to be superb in early September but I have heard that spring will also provide you with lots of excitement. I’ve caught 5 – 6 lb rainbow trout that provide an awesome fight. I am a fly fisherman and have had success using green bead head nymphs and different patterns of backswimmers. I have seen many people trolling and having success with spinning rods but can’t share any personal experience. I’m a catch and release person myself but I believe the catch limit is 1 fish over 40 cm and 1 under so if you’re lucky enough to snag a big one, you’ll enjoy a fabulous dinner I’m sure. The regulations do change so be sure and check before heading out. Of the nearly 300 lakes stocked in Alberta, there are a few where the low stocking numbers and limits mean that the fish grow to larger than 15″. Beaver Lake was the first of these lakes followed by Muir, Bullshead, Ironside, Police and Fiesta (the latter also very close to JRR). We now have 6 lakes that are “managed” differently. Of the six, only 2 are NO KILL. For the years 2006, 2007, and 2008 Beaver Lake was stocked with 10,500 rainbow trout ranging in size from 19 – 26 cm. Hiking is not great around the lake as there is minimal walkable shoreline between the water and land. However, there is an open field area, picnic tables and washroom facilities if you desire to do some shoreline fishing. Having said that, this spot is much prettier from the water than from the land. 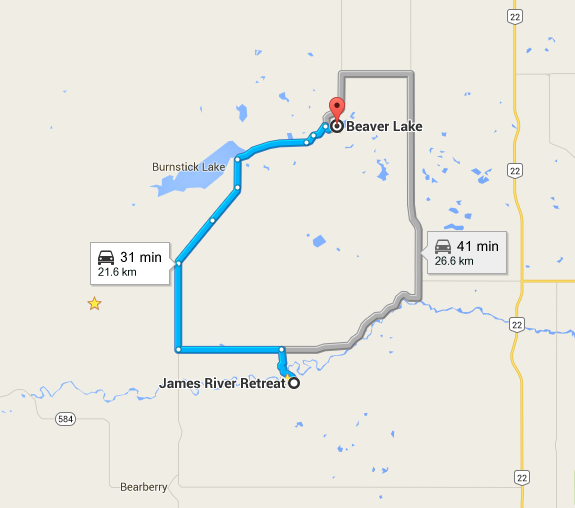 So, dream a little dream, tuck the map below out at the cabin, and take a jaunt to Beaver Lake sometime this season. This entry was tagged beaver, beaver lake, canoe, day trip, duck, eagle, fish, fishing, kayak, king fisher, lake, loon, osprey, trout. Bookmark the permalink. ← Are you Bear smart?